A World With Heroes est un album hommage à la formation KISS, mettant en vedette des membres provenant, entre autres, des formations L.A. Guns, Firehouse, Great White, Guns N’ Roses, Slaves On Dope, Honeymoon Suite, Whitesnake, Slaughter, Tesla, Queensryche et Cinderella ainsi que le Montréalais Rick Hughes. Cet album viendra en aide à la Fondation des soins de santé de Vaudreuil-Soulanges. Afin de célébrer le 40e anniversaire du groupe et d’amasser des fonds pour une maison de soins palliatifs, la population est invitée à participer à la création de A World With Heroes grâce à PlegdeMusic. Ce site est la nouvelle avenue pour les fans voulant s’impliquer directement avec les artistes! En visitant le site PledgeMusic, ils pourront se procurer des items de collection, des leçons de musique et plusieurs autres exclusivités tout en contribuant à la confection de cet opus. C’est à la suite du décès d’un proche que le journaliste montréalais, photographe et surtout amateur de musique rock, Mitch Lafon a proposé ce projet à tous les artistes rock avec qui il a déjà collaboré. À voir toutes ces vedettes du rock réunies, on peut dire que Mitch Lafon a gagné son pari!! Mitch Lafon est disponible pour entrevues. Don Dokken, Mark Tornillo (Accept), Terry Ilous (Great White), Bumblefoot (GNR), Mark Slaughter (Slaughter), Russ Dwarf (The Killer Dwarfs), Ron Young (Little Caesar), Doug Aldrich (Whitesnake), Rex Brown (Pantera, Kill Devil Hill), Dery Grehan (Honeymoon Suite), Bill Leverty (Firehouse), Phil Lewis (LA GUNS), Doro Pesch, Tommy Denander, Slaves On Dope (w/Jason Rockman), Phil Naro (ex-Talas & Peter Criss), Ron Keel, Sean Kelly (Nelly Furtado’s band & Helix), Rex Brown & Mark Zavon (Kill Devil Hill), Chris Van Dahl (L.A. Guns), Willie Basse (Black Sheep), Geoff Tate (Queensryche), Chris Buck, Rick Hughes et encore plus à venir. La Fondation des soins de santé de Vaudreuil-Soulanges oeuvre à offrir des soins palliatifs spécialisés à des personnes de tout âge (enfant, adolescent, adulte) atteintes d’une maladie en phase terminale, dans le respect et la dignité. Engagez-vous. Faites partie de cet hommage incroyable pour une cause québécoise. 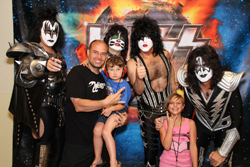 A KISS tribute album with international rockers for a local cause! 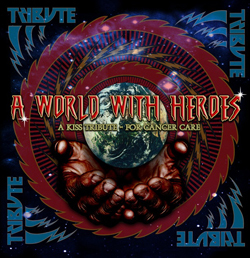 A World With Heroes, a KISS tribute album, features members from classic bands like L.A. Guns, Firehouse, Great White, Guns N’ Roses, Slaves On Dope, Honeymoon Suite, Whitesnake, Slaughter, Tesla, Queensryche, Cinderalla as well as the Montrealer Rick Hughes. Proceeds go to help the Vaudreuil-Soulanges Palliative Care Residence. In order to celebrate the 40th anniversary of the band and to raise funds for the palliative care residence, the public is invited to participate in the creation of A World With Heroes, through PlegdeMusic. The PledgeMusic site is a new way for fans to get directly involved with artists. By visiting the site and contributing to the making of this album, fans can obtain collectible items, music lessons from some of the artists involved, and other exclusives. After the death his father-in-law, Mitch Lafon, Montreal journalist, photographer, and above all, rock music fan, proposed this project to all the rock artists with whom he had collaborated in the past. Who knew there would be such a positive response from so many of them!! Don Dokken, Mark Tornillo (Accept), Terry Ilous (Great White), Bumblefoot (GNR), Mark Slaughter (Slaughter), Russ Dwarf (The Killer Dwarfs), Ron Young (Little Caesar), Doug Aldrich (Whitesnake), Rex Brown (Pantera, Kill Devil Hill), Dery Grehan (Honeymoon Suite), Bill Leverty (Firehouse), Phil Lewis (LA GUNS), Doro Pesch, Tommy Denander, Slaves On Dope (w/Jason Rockman), Phil Naro (ex-Talas & Peter Criss), Ron Keel, Sean Kelly (Nelly Furtado’s band & Helix), Rex Brown & Mark Zavon (Kill Devil Hill), Chris Van Dahl (L.A. Guns), Willie Basse (Black Sheep), Geoff Tate (Queensryche), Chris Buck, Rick Hughes and more to come. The Vaudreuil-Soulanges Palliative Care Residence offer specialized palliative care to individuals of all ages (children, teenagers, adults) who have a terminal-phase illness in an environment of respect and dignity. Pledge to be a part of this amazing tribute and great cause. Mitch Lafon is available for interviews.